Below are opportunities whereby you may support Calvary Christian High School in helping us fulfill our mission. Each year, numerous people give to CCHS to enable us to offer a world-class Christian education. We welcome the opportunity to meet with you and share the wonderful and exciting things God is doing at CCHS. Please feel free to contact Mrs. Karen Fisher, Finance Coordinator at fisher.karen@cchs.us, or by phone at 727.449.2247. CCHS is grateful for all online donations. Select this link to submit the requested information and donation online via credit card. You will have the opporutnity to make the donation in honor, recognition, or in memory of someone. Additionally, you may designate the donation to a project, group, team, or activity. Thank you for supporting Calvary Christian High School. Choose this link to set up or connect your Amazon account to the CCHS AmazonSmile Account. Then each time you shop on Amazon, CCHS will receive a donation credited to the school. 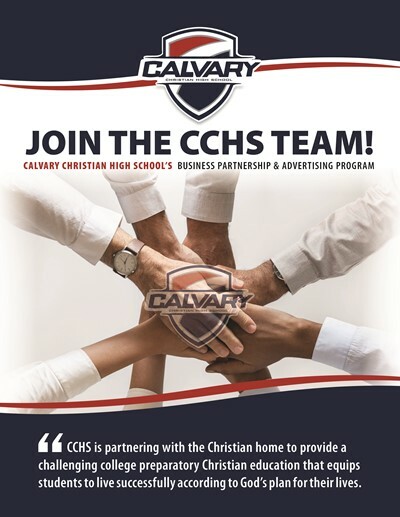 Calvary Christian High School offers opportunities for local businesses to partner with the school to help us fulfill our mission. The business partnership programs provides opportunities of exposure for the business to the thousands of people attending school events. We believe it is a win-win program. The school receives financial support from committed businesses in the community, and the business gains recognition and exposure to thousands of people who attend school activities and events. During the 2017-18 school year, Calvary hosted 171 home athletic events. The attendance to these events was nearly 40,000 people combined. View the information brochure and partner with us today for the 2018-19 school year. Select the link below to download the Business Partnership brochure.